Drivers enrolled under Siksha Samarth may avail online tutoring and career counselling for children of all enrolled drivers and owner drivers. Meritorious students of customers, owner-drivers and drivers in Class 8 to Class 10 who are eligible under the scholarship scheme of Tata motors will receive one year free subscription of Toppr for relevant academic year. Tata Motors, India’s largest commercial vehicle player today launched a first-of-its-kind Pioneer program, with an aim to acknowledge and promote the driving profession in the trucking space. Under this initiative, Tata Motors Samarth will endeavour to address four critical areas for the drivers’ well-being, which are presently identified as Swasthya (Wellness program), Sampatti (Finance program) and Siksha (Education program) along with Surakshit Samarth (driver on wheel insurance). The program will be launched PAN India and will attempt to reach out to more than 5 Lakh drivers every year. Extending the benefits to the driver’s family and securing their future, Tata Motors along with Oriental Insurance Company has introduced Surakshit Samarth, which provides an accidental death or disability cover up to INR 10,00,000 per year, per vehicle for drivers and owner drivers linked to the Chassis, since 2011. Today, in association with Tata AIG General Insurance Company, Swasthya Samarth aims to provide health insurance products including 2 comprehensive health checkups covering 6 health profiles/57 testsand INR 50,000 hospitalization coverage, with an option to upgrade to family cover. The program will be linked to new vehicle sales and the policy will be issued by Tata AIG. TATA AIG will also be setting up free medical camps at Tata Motors defined locations. On the launch of TATA Motors SAMARTH program, Mr. Girish Wagh, President, CVBU, Tata Motors said, "True to the philosophy of connecting aspirations, we at Tata Motors are driving our efforts towards driver empowerment and welfare. Our program ‘SAMARTH’ is tailored to make the entire trucking profession dignified. We intend to cement our long-lasting relationship with our customers and their drivers to safeguard their health, ensuring overall wellbeing of their families and in the process uplift the quality of life for them." Along with healthcare benefits, SampattiSamarthplans to encourage investment habits among drivers through its SIP offering by ICICI Prudential and TATA Mutual Funds, with a lock-in period of 3 years, as well as conduct financial literacy camps for drivers and owner drivers across India.Furthermore, Tata Motors has joined hands with Toppr and introduced Siksha Samarth. Toppr is a learning app for classes 5th to 12th that helps students prepare for every board, competitive and scholastic exam. Toppr personalizes learning by creating a unique path for each student based on their strengths and weaknesses. On Toppr, students can watch free video lectures, practice questions designed for them, attempt mock tests and get their doubts solved 24×7. More than 7 million students trust Toppr to learn better. Meritorious students of customers, owner-drivers and drivers in Class 8 to Class 10 who are eligible under the scholarship scheme of Tata motors will receive one year free subscription of Toppr for relevant academic year. Apart from the grueling work schedule, extended periods away from home, commercial vehicle drivers and owner drivers have the additional pressure of healthcare costs. The launch of the all-encompassing initiative by Tata Motors is designed to positively impact the Commercial Vehicle community and work towards improving society’s perception of this profession. 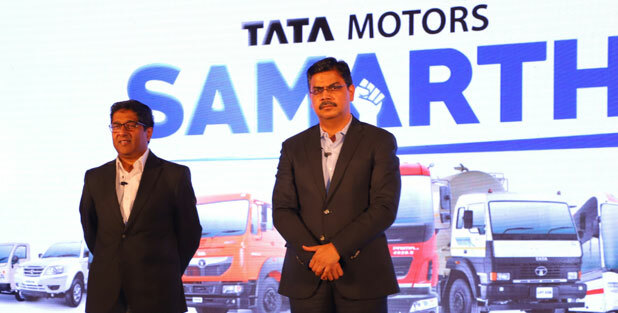 Through TATA Motors Samarth Program, the company is providing a common platform for various industry stakeholders to reach out and address the Health, Education and Finance needs of drivers’ community via their customize product offerings. Terms and Conditions of the respective Associates i.e. TATA AIG, Oriental Insurance Company, ICICI prudential, TATA Mutual Fund and Toppr Technologies Private Limited (Toppr) shall apply. Participants may contact Tata Motors Dealerships for any details pertaining to the program, including its respective terms and conditions, and enrollment therein. Tata Motors Limited (BSE: TATAMOTORS), a USD 45 billion organisation, is a leading global automobile manufacturer of cars, utility vehicles, buses, trucks and defence vehicles. Part of the USD 100 billion Tata group, Tata Motors is India’s largest and the only OEM offering extensive range of integrated, smart and e-mobility solutions. Tata Motors has operations in the UK, South Korea, Thailand, South Africa, and Indonesia through a strong global network of 109 subsidiary and associate companies, including Jaguar Land Rover in the UK and Tata Daewoo in South Korea. With a focus on engineering and tech enabled automotive solutions catering to the future of mobility, Tata Motors is India’s market leader in commercial vehicles and amongst the top four in the passenger vehicles market. With ‘Connecting Aspirations’ at the core of its brand promise, the company’s innovation efforts are focused to develop pioneering technologies that are sustainable as well as suited to evolving aspirations of the market and the customers. Tata Motors strives to bring new products that fire the imagination of GenNext customers, fueled by state of the art design and R&D centers located in India, the UK, Italy and Korea. Internationally, Tata commercial and passenger vehicles are marketed in countries, spread across Europe, Africa, the Middle East, South Asia, South East Asia, South America, Australia, CIS, and Russia. Tata Motors Partners with Valvoline Cummins in Ind ..